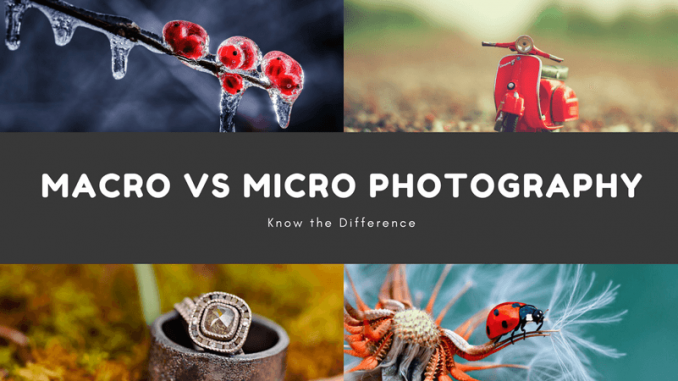 There are plenty of people out there who are still confused what the difference between macro and micro photography is! Those who understand the camera, lenses, and photography can understand the primary difference regarding the clarity and details of the picture, but unable to answer about the technicality. Moreover, there are very few articles available on the internet which can guide the beginners about the same. So, here in this article, you can get all the answers related to macro vs micro photography and even the difference between the micro and macro lenses. Kindly read further to get solutions. In simple terms, Macro means big and micro means small. That means macro photography includes big and wider images, whereas micro photography includes detailed and focused images. You can see each and every detail – even the smallest one – if you do Micro photography! Capturing the clearest picture, with all the clean details, is the fundamental difference between micro and macro photography. The lenses which are helpful in such photography are expensive as such lenses can capture those things which might not be seen easily. Many people, especially who are beginners get confused between the functionality of Micro and Macro lenses. Let us help you to decide what you need one and when you should use one. When we talk about lenses, both lenses are different just by names for the exact purpose. Let’s say for example; we have few macro lenses – the 60mm F 2.8 for the Canon system and the 105 millimeter F 2.8 for the Nikon system. Both the manufacturers have a wide in similar range. The first thing to get out the way is the name is it macro or is it micro and what’s the difference! Well, there is no difference. Nikon calls their lenses micro, and almost everyone else calls them macro, but they mean the same thing. The names though give away their use close-ups anything small and detailed makes a great macro photo subject. See, the notable items include things like insects, butterflies, and flowers. But also popular are human eyes, water drops, and ice crystals. The main thing to consider when picking a macro lens is the focal length. Long focal lengths like the 100 mils and 105 mils are suitable for flighty subjects like insects because you can keep your distance. They are also good for studio use for portraits for the same reason longer focal lengths like 180 ml macro are also available for more extreme requirements. But more common is the 60 mil. These lenses tend to be a little bit cheaper. They are useful for the things like flowers, stamps, and coin photography. 60 mil comes up a close to hundred mils on an APS-C or DX body like the Canon 50d, so it can be particularly helpful if you’re just getting started as it’s so flexible. You can also use Altura flash for canon for more details and some fantastic night clicks. Both Nikon and Canon keep adding to their range of micro and macro lenses; for example, Nikon has their 40 millimeter Micro DX bodies and third-party manufacturers like Sigma have more affordable variants for standard focal lengths. So, choose as per your need, comfort, and convenience. So now, if you are ready to get started with photography, it is recommended to check out the full range of macro and micro lenses online or in the camera market. There are some best flash for canon which can make your work way easier than you think; so try them to choose the best one for you. We hope you got all the solutions regarding what is micro and what is macro! So, can we ask now either you are ready for some amazing clicks or not??? Of course, you are! All the best and rule!